Combining a high concentration of probiotic and MOS prebiotic with nucleotides. Proven to increase forage digestibility by up to 100% in a study conducted by Hartpury College. A blood-building supplement with organic iron, organic copper, vitamin B12 and folic acid. Redjuvenate™ aids oxygen transportation and ensures optimum fitness and recovery rates. As well as forming a key part of the triple-action digestive supplement, nucleotides are essential building blocks of DNA and RNA and are therefore essential to every cell in the body. Nucleotides help support immunity, stamina, cell replication and repair of cell damage. This ensures the correct functioning of the metabolic system, central nervous system, immune system, proper growth rates, bone strength and joint health. Blue Chip uses organic/chelated minerals to ensure optimum absorption and effectiveness. 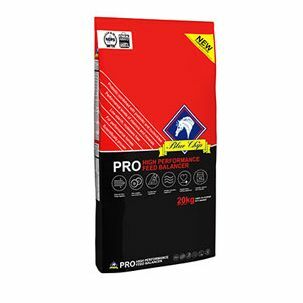 Pro contains enhanced levels of key minerals to meet the needs of high performance horses. High quality, digestible protein, sourced from soya. Proteins ensure that muscles develop correctly and recover quickly after strenuous exercise. Please feel free to contact Marrowell Farm for a no obligation chat about your signage requirements.